Always have the most current address information with NCOALink® processing. NCOALink is a USPS® service that contains the names and addresses of individuals, families, and businesses who have filed a permanent change of address. Our NCOALink services offer you real-time processing, 24-hour access, and data security, so you can process an unlimited number of records safely and easily. BCC Software offers NCOA services at two levels — NCOALink FSP and NCOALink LSP. Both services include DPV®, LACSLink®, and SuiteLink® processing. This option will update your list(s) using 48 months of data from the database of permanent National Change of Address (NCOA) forms filed with the United States Postal Service®. This option updates your list(s) using 18 months of data from the database of permanent NCOA forms filed with the United States Postal Service. It also includes ANKLink® processing, which identifies moves that occurred between 19 and 48 months ago. This returns the Move Effective Date (MED), but not the new address. NCOA processing is available through BCC Mail Manager™, LENS®, and GoData™. 12% of the population of the United States moves every year. Consider what that means for your lists. If 1% of your list of 150,000 records have moved, then 1,500 records are now out of date. With BCC Software’s NCOALink Services, you can submit lists for change of address processing on a regular basis. Reduces undeliverable mail with the most current address information. Matches addresses to the NCOALink file for individual, family, and business moves. Prevents re-mailings after address corrections are received. Lowers mailing costs overall by reducing undeliverable mail pieces. Provides faster product and service marketing through accurate mail delivery. Find Moves That Are Never Reported to the USPS. 40% of moves each year are never filed with the USPS. Now, with BCC Software's PCOA processing services, you can easily access them. Learn more. Looking for NCOA Return Codes? 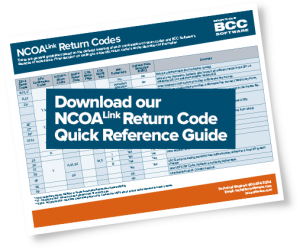 Download our NCOA Return Code Reference Guide – or sometimes simply referred to as an NCOA form – here.